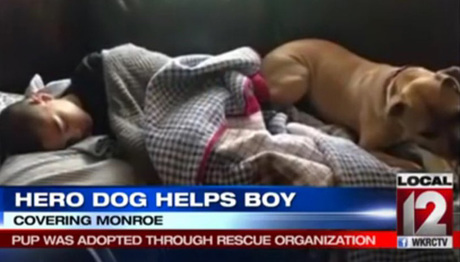 In Monroe, Ohio the Daniel’s family adopted a pit bull through Cincinnati’s bully breed rescue Adore-A-Bull. 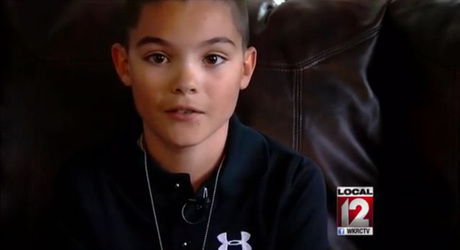 The Daniels family are loyal breed supporters and feel the breed has gotten a bad rap. Pit bulls are constantly making headlines for attacking humans and the entire breed is paying for some aggressive behavior, that many people are saying is caused by the owners. 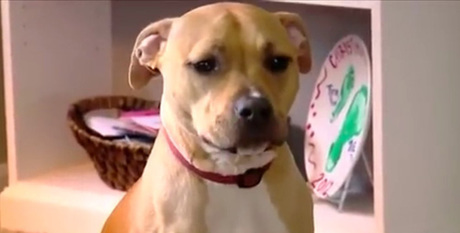 The Daniel’s family adopted Ember, their second pit bull, last year. They say she has always had a close connection to their ten year old son Tre and sometimes sleeps at the end of his bed. Thankfully, when Tre had a medical emergency, Ember was right there and ready to jump into action. Mrs. Daniels said she woke to the sound of Ember making a strange noise and pacing. She knew something was wrong and followed Ember straight to the bathroom where she discovered her son’s feet hanging over the outside of the bathtub. It seemed as if he had fallen in, his head was tilted back. Tre suffered a seizure and was able to get the medical help he needed right away thanks to the fast acting and loyal pit bull. Mrs. Daniels told a reporter that as soon as Tre was home from the hospital, Ember would not leave his side. The ASPCA offers helpful tips for anyone considering adding a pit bull to the family. Socialization is key and should start early. Also they receptive to trick training and often graduate at the top of their class in obedience schools. Pit bulls are one of the most controversial breeds and the press loves to promote the negative stereotypes associated with certain dogs without ever looking at the dogs past or the humans who raised it. They are banned in some countries and in many cities in the United States. Some cities have mandated sterilization and microchipping with the breed, and require they be muzzled in public places. Ember was abandoned as a puppy on the streets and picked up by the rescue. She was adopted and loved. Now she gets to show love to her favorite person, ten-year-old Tre who loves her right back.